Perhaps it’s best to learn the basic components of a climate-controlled system, which contains a source of warmed air or cooled air, a manner of distributing the air to a certain space, and a thermostat in which to control the air. To be clear, a source of warm air would be a furnace, while a source of cool air would be an air conditioner. For the most part, the furnace and air conditioning unit in a residential system share the same distribution or control system. In other words, the warm air and cool air flow through the same ductwork, only changing based on season and temperature desired. Generally speaking, whenever there is a malfunction in a HVAC system, it is usually with one of these three main components. With a greater understanding of the basic parts of a HVAC system, it’s easier to explain how air actually flows. Naturally, heat flows away from a warm environment to a cooler one. Thus, a furnace emits heat into a space to make it warmer. On the other hand, an air conditioner doesn’t push cooled air into a space to make it cooler. Rather, it removes heat, and this causes the space to become cooler. 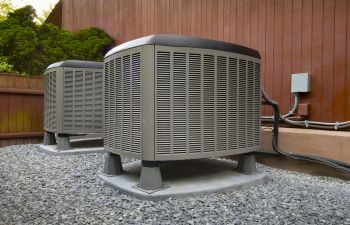 Even so, moving the heated or cooled air throughout an entire home is a bit more complicated to explain. That’s because it depends on the type of system and the principle by which it heats and cools. As an example, a forced-air system distributes air (whether heated or cooled) through a blower fan powered by electricity. The air is pushed through a series of ducts to different rooms inside a home. Meanwhile, another series of ducts act as a “return system,” taking the air back to the furnace or air conditioner to be warmed and cooled before “forcing” it through the home again. Aside from the forced-air system, there are others, some of which operate on the idea of gravity or by heating panels that radiate heat energy into a home. While it’s wise to learn the basics of your heating and cooling system, the professionals at ClimateSmith, LLC, want you to know—you can count on us anytime, and we do not expect you to understand all of the details relating to your HVAC system. That’s our job! If you reside in Alpharetta or a surrounding metro-Atlanta area, the licensed and insured HVAC specialists at ClimateSmith, LLC, provide repair and installations services at a reasonable price. Call us today!